Your visitors are the most important person on any given day. Now you can collect all their information and easily keep track of them. Visitor tracking is now simple. Easily check your visitor reports and see who and when your visitors attended. 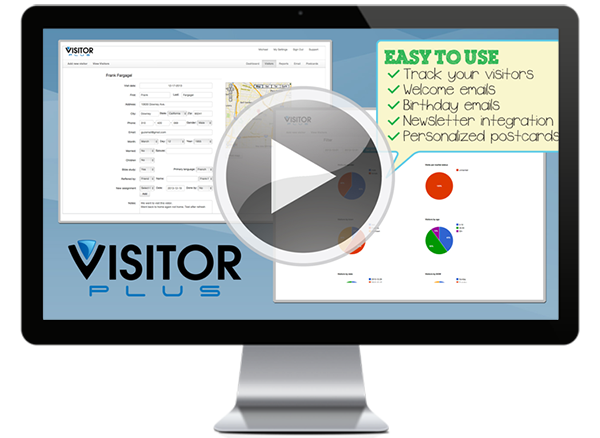 Visitor Plus gives you a full report of all your visitors in any given period. Send custom postcards directly to each one of your visitors. Each postcard will be setup with a custom message for your visitor. How's that for a friendly follow up? Once a visitor's information is inputted Visitor Plus will automatically send them a welcome email. You can also remind them of upcoming events or add them to your newsletter. At any given time you might have multiple visitors in attendance. Keeping track of them has never been easier. Simply fill in their information into our system and you can easily keep in touch with them. Send them a welcome email, postcard or forward to one of your members for a personal follow up visit. Visitor Plus will change the way you keep in touch with your visitors. We know your visitors are important to you. With Visitor Plus they'll feel that importance. With Visitor Plus Pastors and church leaders have the ability to monitor all visitor activity. I was happy to run into a visitor tracking system such as Visitor Plus. It has helped me keep my department in order and allowed me to focus more on reaching out to visitors and not have to worry about constantly updating data on spreadsheets. The system makes more simple, now I’m able to track when and how many times has person visited us. Visitor Plus is an amazing system and fits perfect with the needs of our congregation. It is of the utmost importance to connect and stay connected with people who visit us. We have many people in our PR department and they are all able to access visitor information from anywhere and reach out to our visitors in a moment’s time. I like the fact that we are able to send visitors a welcome email as soon as we receive their information. We can also mail them a postcard thanking them for visiting us, and all, at the click of a button. We host many events throughout the year and it is so easy to forget and send reminder of upcoming events to our past visitors, but with this system we have been able to stay on top of all our visitors and we have had great turnouts at all of our events. I like the thought that went into to building this visitor tracking system. It has catered to the needs of our outreach ministry. Since we implemented Visitor Plus, we have not missed staying in connected with visitors. The visitor return rate has tripled with Visitor Plus. No visitor falls through the cracks, reaching them has been much more effective, and keeping track of them has been a lot easier. I have used one different system for the visitor tracking of our congregation and the difference has been day and night. I can access Visitor plus from anywhere there is internet access. Not only that but I am able to create accounts for other members of our outreach department and overview view and manage them. From the software we are able to send upcoming events to visitors via email and in writing. We can also select a postcard from available templates, personalize a message and click send and a postcard is sent to them automatically. It’s an amazing visitor tracking system. 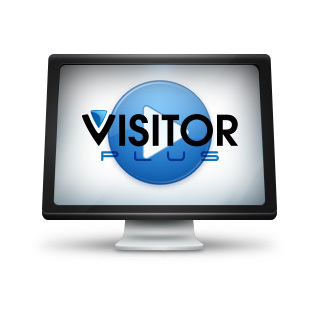 Visitor Plus is a great system to use for visitor tracking and updating. Because our congregation works in teams, visitor plus makes it easy for us. We are able to see who, and how many times a visitor has been reach through a visit, letter, call postcard etc., Saving us time and keeping the team on track focusing on what’s important, and that is reaching engaging our visitors in a timely fashion.